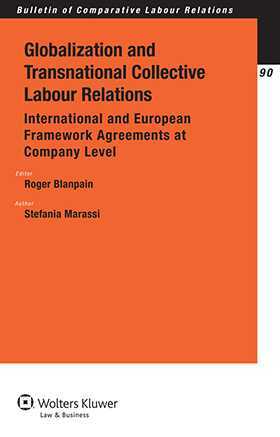 Globalization and Transnational Collective Labour Relations is a practical, explanatory work that will help you identify the similarities and differences between IFAs (International Framework Agreements) and EFAs (European Framework Agreements). It analyses in detail the texts of IFAs and EFAs concluded by multi-national enterprises (MNEs) with a total of more than 80,000 employees in 2013. The authors identify titles, signatories, sectors involved, content, addressees, duration, revision, renewal, termination, and follow-up procedures, as well as legal status and legal effects. If you are a labour lawyer, policymaker, regulator or government official, Globalization and Transnational Collective Labour Relations is the one-stop source of information to help you fully understand this topic. Chapter 1 Transnational Collective Labour Relations. Chapter 2 A Comparative Analysis between International Framework Agreements and European Framework Agreements at Company Level. Chapter 3 Legal Issues concerning International Framework Agreements and European Framework Agreements at Company Level.